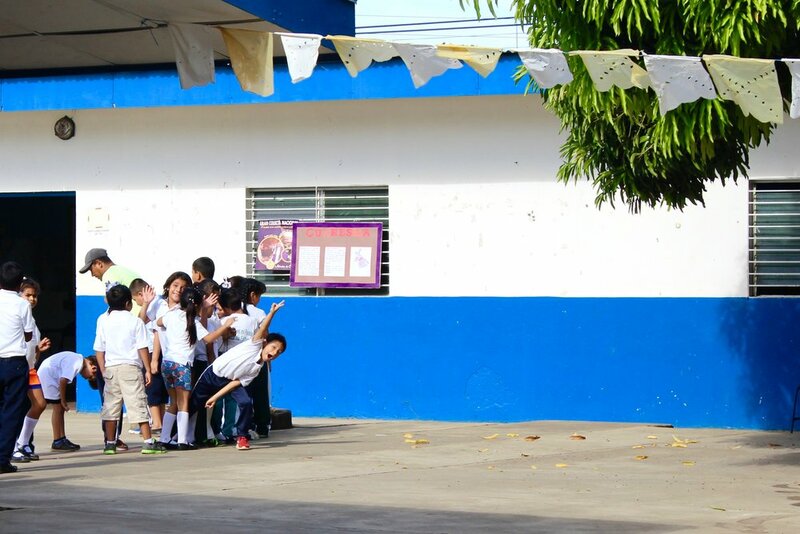 In León, Nicaragua, there are children everywhere: walking to school, running through the town square, laughing in small groups on the corner of every street. They are a constant presence, and always will be. Children and teenagers make up a large part of the Nicaraguan population; in fact, nearly 50 percent of the population is under the age of 24 (“The World Factbook:). In 2009, 54 percent of that population, of minors, experienced some sort of physical or psychological violence (United Nations). It is not uncommon for children to be either a victim or a witness of domestic violence or sexual abuse. But no matter how they experience it, it often affects their school performance and therefore their future. When a student has experienced some form of abuse, they show symptoms at school. They may be angry, sad, scared, or even nervous. Some students lash out, while others are so terrified that they cannot control their bladders. Chinandega, a city about 26 miles from León, always bustles with activity. The dusty streets are lined with food and produce stands, and countless people weave their way through the maze of stalls. Car horns honk, people yell, and the day goes on as usual. Yet inside the Asociación de Mujeres Luisa Amanda Espinoza, it is quiet. The women’s association is home to a single classroom that is rented out by an English-language teacher. Next to that classroom is the office of Michael Ríos, a clinical psychologist who works with children. The room is small, hot, and dimly lit by a lone fluorescent light that hangs from the ceiling. But yet, the room is just enough space for Ríos to see patients, and in those patients, he sees symptoms of abuse. “They’re aggressive toward others, they want to commit suicide, they’re hyperactive; they’re the ones who absorb it all,” he said. In more urban areas, some schools are able to employ psychologists to treat students. Ríos, although he sees more than just students suffering from abuse, treats six students a day. His services are provided to the children for free. Beyond the students, Ríos also works with the parents of the victims. What becomes even more troubling is that most children are affected long term by domestic violence or sexual abuse. Oftentimes, victims cannot perform well in school, which affects their grades. Guadalupe Carmona has been the principal of the school system in La Ceiba, a rural community near León, since 2007. She splits her time between two schools, a high school and an elementary school. Her office in the administration building of the high school is small, dark and practically empty. Light pours into the room from the single, barred window. She sat at her desk, the only furniture in the room. The sound of teenagers outside in the dirt courtyard floated into the office as her normally kind, dark eyes filled with sadness; she began to speak. Carmona explained that when children experience violence and when they show symptoms, it affects their future opportunities. Victims that attend more rural schools, like Carmona’s, do not have access to the resources that other, more urban schools have. Most rural schools, in fact, lack the staffing and funding to employ psychologists, and so the teachers are forced to take on that role. This tends to be problematic because teachers are not trained in psychology and cannot provide help to the extent the children deserve. This has become one of the most worrisome aspects of the situation, and Carmona expressed the frustration and helplessness that she feels. Even though the rural schools lack psychologists, the teachers and administrators provide support to victims in other ways. They try to understand the students’ problems as best they can so they can accommodate for them. The main goal is to connect with the students so they feel comfortable to share what they are going through. However, teachers also meet with the parents and encourage them to be more present in their children’s lives. In most cases, this is all that rural schools can do. According to Carmona, there has been little to no support from the government. Although government officials realize the country is facing a major problem in the form of child abuse, they lack the funding to implement any programs that would benefit victims, she said. It may seem that little can be done to help child victims of domestic and sexual violence. But Carmona has faith that the situation will indeed improve with increased awareness and support. 1. “The World Factbook: NICARAGUA.” Central Intelligence Agency, Central Intelligence Agency, 12 Jan. 2017, www.cia.gov/library/publications/the-world-factbook/geos/nu.html. Accessed 25 Apr. 2017. 2. United Nations High Commissioner for Refugees. “Nicaragua: Prevalence and Forms of Child Abuse; State Protection and Availability of Child Protection Services (2007 - July 2010).” Refworld, www.refworld.org/docid/4e437ca22.html. Accessed 25 Apr. 2017.